St Andrews United will kick off next season in the East of Scotland League. Pic by Blair Smith. St Andrews United took a second opinion on leaving the junior ranks before agreeing to make the move to the seniors. The club met towards the end of last week when those in attendance voted overwhelmingly to stay in the juniors. However, neither manager Andy Brown or his assistant Gordon Brown were at that meeting, leading to another being scheduled on Wednesday night. There, the management team put across their vision for life in the seniors, persuading the doubters to get behind their case and make a late application to join the East of Scotland League. 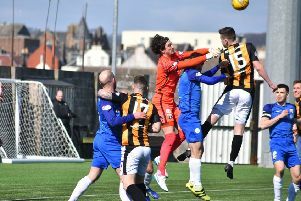 The club’s Leo Micallef said: “Both Andy and Gordon were very positive and allied to the fact that they had already spoken to some of our supporters at Saturday’s player of the year dance meant that they won over many of the doubters. Other clubs have also voted in the past few days to leave the juniors, also having an effect on the Saints’ second vote. All applications will be assessed at next Thursday’s EoS AGM where the new league set up will also be decided.